Stunning display of Dutch tulips at Keukenhof gardens are an absolute must see! Departures from central station of Amsterdam; 15-minute walk from the cruise terminal - perfect for shore excursions! Netherlands' ultimate spring destination - the Keukenhof Gardens is one of the most popular attractions in the world. Each year during a 2-month period you can experience spring in all its glory in the magnificent gardens with stunning Dutch tulips at display. Over 7 million tulips, daffodils, hyacinths and more are planted by hand to create the incredible spectacle! Easily accessible from the cruise terminal, the meeting point for this Keukenhof tour is only a 15-minute walk from the Passenger Terminal Amsterdam and is offered at a better value as compared to the other Keukenhof tours departing from the cruise terminal. Upgrade your tour to include a visit to bulb farm & flowerfields - an absolute must do in Keukenhof Gardens! Your visit is incomplete without a picture at stunning tulip fields, accessible to public only this time of the year and not to forget a guided walk with a local farmer giving away the secrets of his treasure! At the end of your tour you will be returned to the original point of departure. The tour departs from 26 Damrak, just a few steps away from Amsterdam Central Station, IJ-Hal, De Ruijterkade 34 a. Please call our activity operator at least 24 hours prior to start of the tour to confirm departure details. The confirmation voucher includes the local activity operator’s contact details and local telephone numbers at the destination. 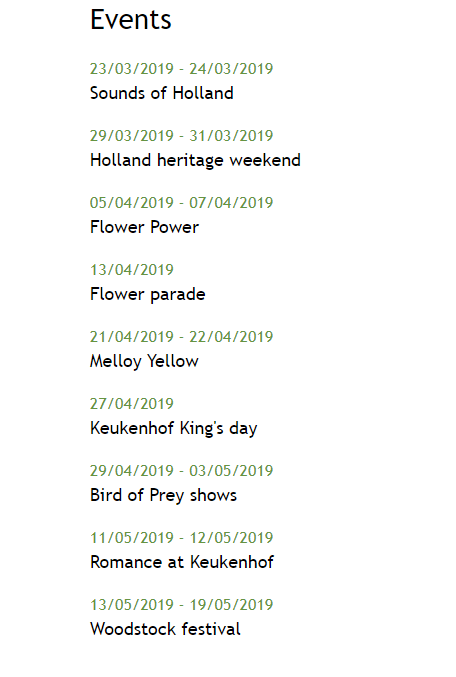 They will happily answer any logistical questions you may have.Keukenhof Gardens are wheelchair accessible. It was amazing!! Would definitely recommend it!! !